One of the basic tenets of biology is that all new cells come from living cells. New cells are formed by the process of cell division which includes both the division of the cell’s nucleus, mitosis, and the division of the cell’s cytoplasm, cytokinesis.. Mitotic cell divisions are used by organisms to repair tissue, growth, and asexual reproduction. Although mitosis is a continuous process, scientists have divided it into distinct stages for convenience and ease of study and understanding of the cellular events: Prophase, Metaphase, Anaphase, and Telophase. In this lab, we will be viewing slides containing mitotic cells and determining what stages each of the cells is in and estimating how long each stage lasts. We will also be comparing normal cells and cancer cells to see how mitosis is altered in cancer cells. Where does one find cells undergoing mitosis? It depends if you are studying plants or animals. Plants and animals differ in this respect. In most plants, the process of forming new cells is restricted to special growth regions called meristems. These regions usually occur at the tips of the stems and roots of the plant. Mitosis in animals can be viewed by looking at the growing embryo of organisms like the whitefish. Question 1: How much time is spent in each phase of the cell cycle? You will have slides of onion root tips and/or whitefish blastula. These are tissues that are undergoing mitosis. The image below shows how the cells will appear for each stage. Proposal: How will you answer the experimental question? Discuss with your group the method you will use to gather data and write a summary below. Your instructor must approve your design before you move forward. Procedure: Your plan probably included most of these elements you'll need,but the details here will help you fine-tune your method. 1. 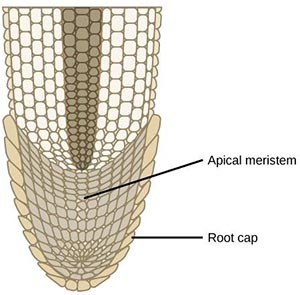 Scan the side under low power first and locate the apical meristem, the region of rapidly dividing cells directly behind the protective root cap. 2. 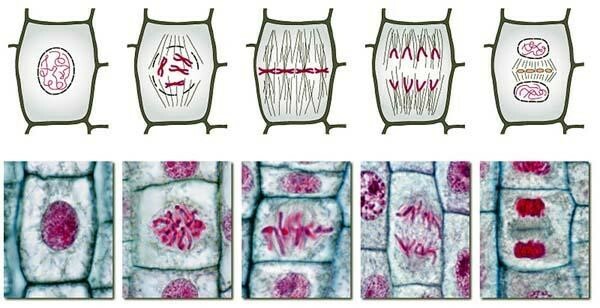 Switch to high power and center your slide in the apical meristem region, so that you have a field of view in which there is a wide selection of cells in various stages of mitosis (including interphase). 3. You are now going to identify the stage of each cell in your field of view. Starting at the top right corner of the field, record the stage of each cell in the data table as Area 1. Count your cells in a systematic manner. 4. After completing the count in this first area (Area 1), move your slide to a new area of the apical meristem region and perform the stage identification and count a second time. Record data for Area 2. 5. Repeat the count a third time in a third area of the apical meristem region and record data. 6. Find the total number of cells in each phase and record this in the table. 9. Calculate the percentage of the cell cycle spent in each phase and record it in the data table. 10. Prepare a bar graph to illustrate your results. Your independent variable is the five stages of mitosis and your dependent variable the percent of time spent in each phase. Complete this CER chart using your data to answer the experimental question. PART 2: How Is Mitotic Index Used in Cancer Studies? Mast cell tumors (MCT) represent a cancer of mast cells, which are a type of white blood cell involved in allergy and inflammation. Mast cell tumors are the most common skin tumor in dogs. 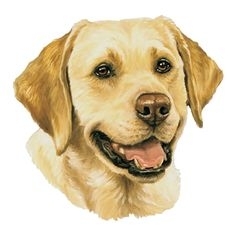 Older dogs are most commonly affected. Some predisposed breeds of dogs include Boxers, Boston terriers, Bulldogs, pugs, Labrador retrievers, and golden retrievers. Mast cell tumors are classified as one of three different histologic grades (grades I, II, and III). Grade I MCT act in a benign manner, and most can be cured with surgical removal. Grade III MCT are more aggressive tumors that are locally invasive and have a high rate of spread (50-90%). Mitotic index (MI) is an indirect measure of cell proliferation that has been demonstrated to be a strong predictor of outcome for several human and canine cancers. The purpose of a study on dogs was to evaluate the utility of MI as a predictor of survival in dogs with cutaneous mast cell tumors (MCTs). A single veterinary pathologist evaluated the HE sections via light microscopy and generated an MI per 10 high-power (400×) fields (HPFs). The region of the tumor sample with the highest overall mitotic activity was chosen for evaluation. A single count of 10 HPFs was obtained for each tumor sample . 1. The data set below was sampled from a single specimen to illustrate how mitotic index can be determined. The mitotic index is the ratio between the number of cells in mitosis and the total number of cells. 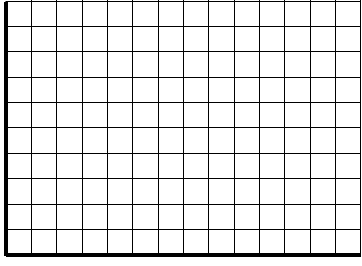 Calculate the MI for each data set. 3. Compare the procedure used to study mast cell cancer in dogs to the procedure you used to gather data on onion cell mitosis. 4. What type of cancer is being studied? Discuss why this type of study my be important (and to whom)? a) What do each of those dots represent? b) Summarize the chart, what does it tell you about MI and tumor grades? 6. Does this information alone help researchers answer their original question. What other information needs to be gathered? 7. Examine figure 2. How can MI be used as a predictor of survivability for mast cell cancer? Be detailed in your explanation, citing evidence from the data shown in Figure 1 and Figure 2. Fig. 2— Fig. 2. 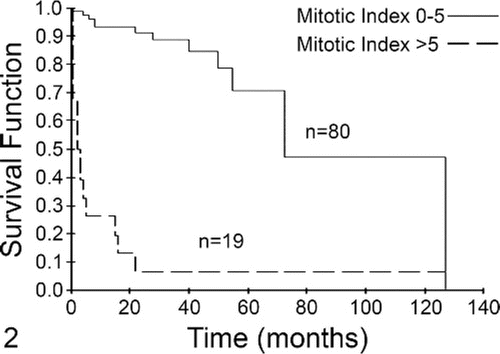 Mitotic index (MI) is predictive of overall survival for dogs with mast cell tumors (MCTs) independent of tumor grade. Dogs with MCTs with an MI of 0–5 (solid line, n = 80) had a median survival of 70 months. 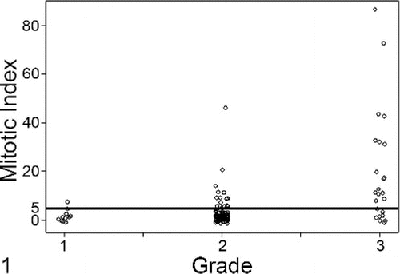 Dogs with an MI >5 (dashed line, n = 19) had a median survival of 2 months. This difference was statistically significant (P < .001).